Our long-standing client Experience Guildford runs a year-round programme of promotions and events to attract shoppers and visitors into the town. 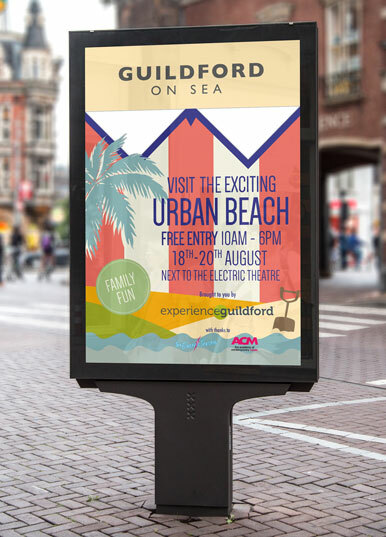 One of the most innovative is ‘Guildford-on-Sea’, which sees part of the town transformed into an urban beach for one weekend in August. We’ve been working with the team at Experience Guildford to develop marketing collateral for the event, including posters and postcards. Our creative is contemporary and graphical, in keeping with the beach’s urban location; but in a nod to tradition, we’ve included the tagline ‘Wish you were here’. As well as plenty of sand, visitors will find seaside staples including deck chairs and beach huts, candyfloss and children’s activities: at last year’s event, there were even lifeguards on standby. The beach, which is open all days and free to enter, will be on its usual site near the Electric Theatre in Onslow Street from 18-20 August.